Allons-y! I thought to myself. Boxing Day treat: I’ll rewatch the Doctor Who Christmas special. 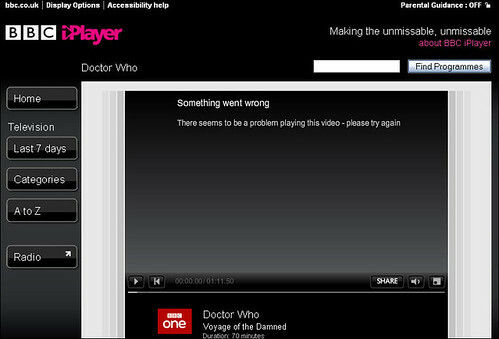 And why not have a go with the BBC iPlayer? Millions of pounds and years in development, it’s bound to be clever, robust, user-friendly. Hell, I’ll even power up Internet Explorer. One Response to Allons-y! Let’s try the BBC iPlayer!